Longer working hours, arguments with partners and 'I don't want to' means we're outsourcing those pesky household cleaning chores. But how does that stack up against the craze for tidying up? Ask people what daily tasks they wish they could cross off their to-do lists forever, and we'll bet cleaning comes up top – possibly on a par with commuting. What brings us to that conclusion? Well, with many of us juggling full-time jobs, spending hours travelling to and from work, doing the school run and caring for ageing parents, it makes sense that tasks like cleaning a house feel more daunting and stressful than they should. It comes as no surprise, then, that many millennials are hiring cleaners to do the household chores for them in a bid to take a load off. 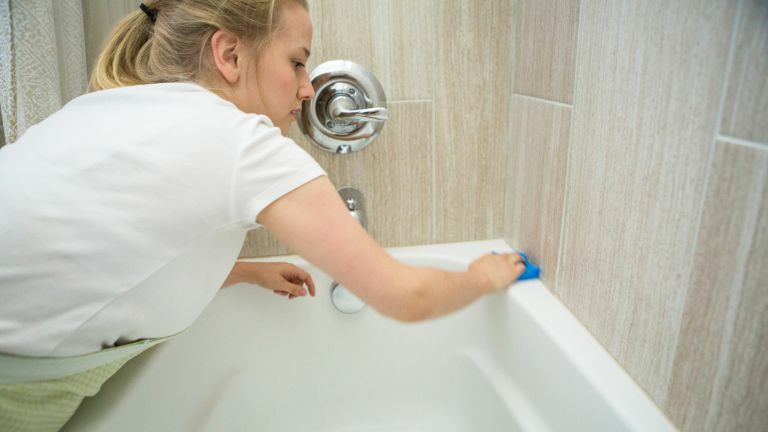 Home interior specialist Hillarys surveyed more than 2,000 people aged 22 to 37 years old on their cleaning habits. When asked, 'Do you have a cleaner? ', 20 per cent of respondents said yes. When asked why, 75 per cent said they don't have enough time to do it themselves, 54 per cent said that cleaning chores caused too many arguments with their partners or housemates, and 38 per cent simply didn't want to do it themselves. Thirty one per cent said they wanted to free up time for other activities, while 18 per cent said they didn't do a good enough job. Do any of those justifications sound familiar? So what are we spending on having a cleaner? On average, those surveyed spent £12 an hour on a cleaner, typically once a week for at least two hours – adding up to £1,248 per year. And those who aren't employing a cleaner – what about them? The most common reason given for not having one was that people couldn't afford one (42 per cent), although many of us (27 per cent) don't trust a cleaner to be left alone in the house, and 15 per cent say they have enough time to do their own cleaning. But how do these figures stack up against Marie Kondo's success on Netflix with her show Tidying up with Marie Kondo, with the increased chatter about cleaning on social media and the frankly bonkers views we've been seeing on the cleaning pages of this very website? Not to mention that charity shops, in the US in particular where Kondon is a big star, are reporting higher donations than usual – and retailers in the UK are remarking that storage sales have sky-rocketed compared to last year. Reading widely on the subject, it seems to us that the express desire to simplify and streamline our homes – whether we spend our weekends decluttering or simply ask a cleaner to restore order while we're at work – isn't just about being neat. The craze for decluttering, tidying and cleaning goes much deeper: to make living in our homes a calmer and less stressful experience which, in turn, helps us to cope with the stresses we face in daily life. The really interesting news? Marie Kondo has also starting schooling others to become tidying consultants. Training can reportedly cost up to £2,000, while maintaining certification is said to cost up to £380 per year – yet there's strong interest in the qualification and seminars in London and New York have sold out. It seems the cleaning revolution has only just begun.